Welcome to our Food Revolution Day Virtual Dinner Party! 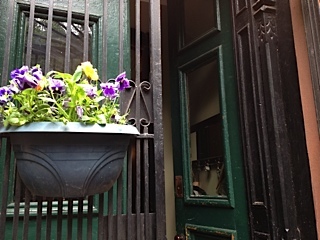 I hope you have been enjoying the delicious offerings of my friends (hop over to their blogs listed below). Wonderful, delicious real food, perfect for family or friends, and I can't wait for Bettina's dessert! 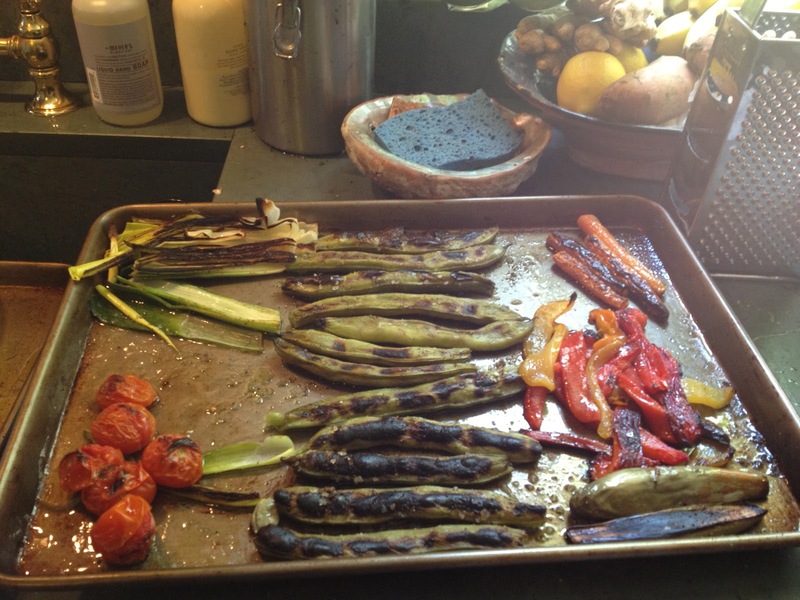 On Mother's Day, my good friend hosted a fabulous brunch and part of the menu was amazing oven-grilled spring vegetables with homemade chipotle mayonnaise. 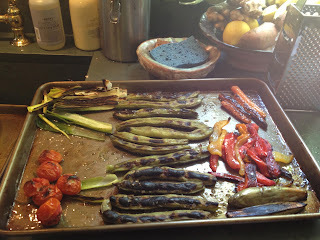 It was a wonderful assortment of spring vegetables: sweet red peppers, baby eggplants, cherry tomatoes, leeks and fava beans! I was inspired and decided to oven grill asparagus for our Food Revolution Day Dinner and try to make my own homemade mayo for the first time. This recipe is shamelessly easy, but amazingly good! Preheat broiler to High. 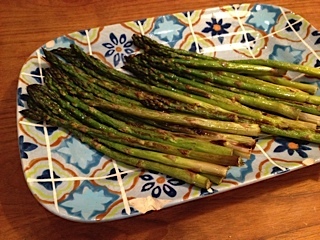 Arrange asparagus on a single layer on a baking tray. Drizzle with olive oil and shake to toss. 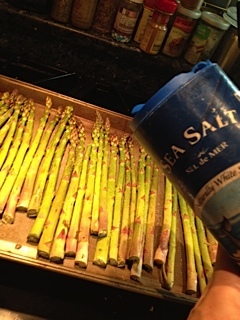 Sprinkle with Sea Salt. Broil on high for 3-5 mins (watch carefully to avoid burning). Turn veggies over and broil 2-5 mins more, if needed. Cooking length will depend on your taste and variability of your broiler. You can let them get pretty dark and then they will really look and taste "grilled," though your kids may prefer them only "lightly browned." Next for the real challenge: homemade mayo! 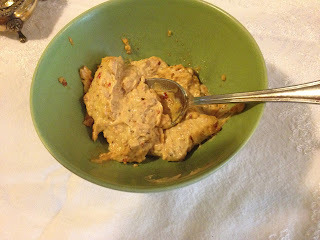 I remembered seeing Jennifer Perillo's super-easy recipe and method for mayo, using a stick blender and decided to give it a whirl. Here is a video below that I first found on her website. Adding garlic gave it a robust flavor so it could hold up to the other grilled fare, and also made it a bit fancier for our dinner party! Soften whole cloves garlic by boiling in water for 10 min. Smash with fork or garlic mincer. Then add to mayo recipe. Place egg yolk, lemon juice, salt, mustard an oil in a tall container, mixing cup, or bowl with high sides. Let ingredients settle for one or two minutes so that yolk settles to bottom. Place immersion blender in cup and slowly pulsate the mixture. In a few seconds, the mayo will begin to form; keep moving blender around the container to fully mix all the liquids. Stop as soon as it reaches the desired consistency, not more than one minute. Serve immediately, or can be save in refrigerator for up to one week. What a great way to celebrate Jamie Oliver's Food Revolution Day! 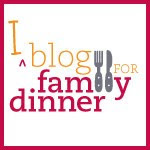 I hope you enjoyed it and feel to share your favorite recipes or real food blog posts in the comments section or via Facebook or Twitter (@eatdinner). Get into the kitchen this weekend and make some real food to enjoy with your family! 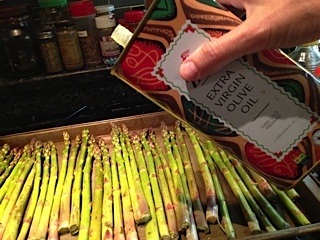 I love grilling or roasting asparagus - I usually do a roasted red pepper sauce but will try the mayo next time! Yum! This sounds delicious, Grace! Asparagus is one of my favorite vegetables and now I have to try the garlic mayo. This dinner was fun - let's do it again!